Wait a minute. Eye? Eyebrow? Winker and not blinkers? Doesn't this guy have two eyes? Yes he does, but one of them is dead, just like his creator, me. The irony in this feature is that I decided on it and had it designed and partially implemented when some power greater than my own decided to turn off one of my lamps. Coincidentally, I lost the right eye, the same one old Albert can't use. So, here is the figure I nicknamed—so I could address him as I built him—Deadeye Albert McNasty. He has some other features, too. He spits from between his front teeth, sticks his tongue out, and blows smoke out of his ears. He can spit with his mouth open or closed and with his tongue in or out. ...be a ventriloquist. Meet Albert and Woody. 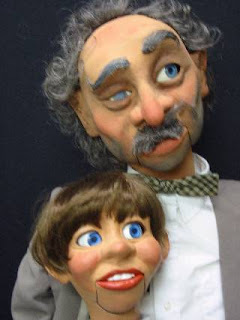 That's right, Deadeye Albert is himself a ventriloquist. 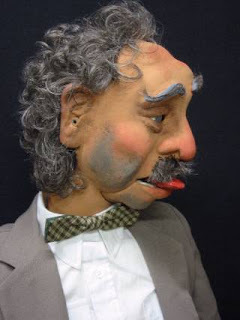 His dummy can be placed on his lap during a performance, so the real ventriloquist doesn't need to make an entrance with the little guy already installed. 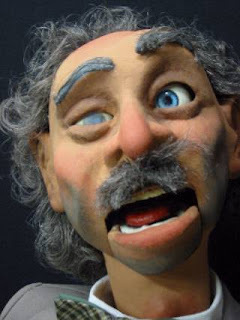 And the dummy's dummy moves not only his jaw, but his head and eyes, too. Why so much detail? Because someone told me it couldn't be done is why. The project is not quite finished, however. There's still a second dummy's dummy to build, which I can do much faster now that the prototype is completed and works so well. By the way, I could not have done this project without the able assistance of my good friend and colleague, John Parisi, the president of the Central Florida Ventrloquist's Association, and an enthusiastic and dedicated figure builder.